Premiere Bail Bonds Santa Cruz : Call 800-662-0056. 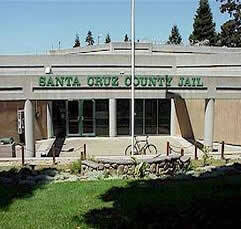 Do you need to post bail for an inmate in the Santa Cruz County Jail? 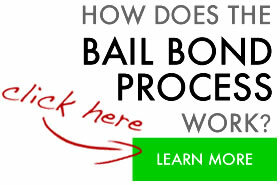 A licensed bail bondsman is available to help you through the bonding process. Premiere Bail Bonds (800-662-0056), a California-licensed bail agency, has been posting bail bonds in Santa Cruz for over 15 years. We will provide you with the information you need to know to make a decision when posting bail for someone. Many of our bonds are written by phone or fax from the comfort of your home or office. If you prefer we will meet you in person at your home or office or you can come to us. Learning the proper bail bond procedures and locating the necessary information – bail amount, booking number, charges, court date, etc. – can be time consuming and stressful. When you call Premiere Bail Bonds toll free, 24 hours a day, you can have an experienced, professional and licensed bail bond agent working for you. We can handle the entire bail bond process on your behalf. Below is a list of Cities in Santa Cruz that we service: Aptos, Ben Lomond, Bonny Doon, Boulder Creek, Brookdale, Capitola, Corralitos, Davenport, Felton, Freedom, La Selva Beach, Mount Hermon, Rio del Mar, Santa Cruz, Scotts Valley, Soquel, Watsonville. Many of the bail bonds we write are signature bonds. This means that you may not need collateral to post bail for your friend or family member in custody. Your signature might be all we need, and in many instances we can obtain your signature via fax. 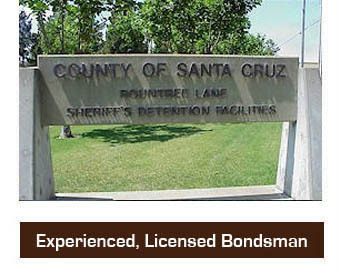 To learn more about signature bail bonds in Santa Cruz, please call Premiere Bail Bonds at 800-662-0056. Below we have listed additional counties and cities that we write bail bonds in. Often times we have cosigners in one county and the defendant in jail 5 counties away. Please feel free to contact us for a bail bond in any of the areas below or anywhere throughout California as we may have agents there as well.